Beulah one of the dedicated blogger, she is one whom i choose to ask my first guest post, i always amazed of her baking talent, every thing she learnt from her browser only, i know google and youtube are her best friends, she spent more time and take pretty risk for baking.. She had a busy schedule with her two lovely kids, and i should say most of her followers don’t know her profession, she is Dental Doctor, as the love & passion for cooking and baking make her to stand in the blogger platform.. I wish beulah to see many more blog anniversary, and to have a successful journey in the path..
After starting my guest i heard few rumours about the guest post events for food bloggers, kind of google is not encouraging guest for foodies, i was upset and kept silent for my guest, even i returned few friends data, here i wish to apologise for the situation.. Let you guys learn this super duper Truffle Cake..
A big hello to all the readers of Sujitha Easy Cooking, my name is Beulah Arun and I blog at FullScoops. A short introduction about me, I am dentist by profession but now I am a busy homemaker with two beautiful kids. I started writing my blog for fun and now it’s become a part of me and I’m quite passionate about it! I truly enjoy baking and cooking! 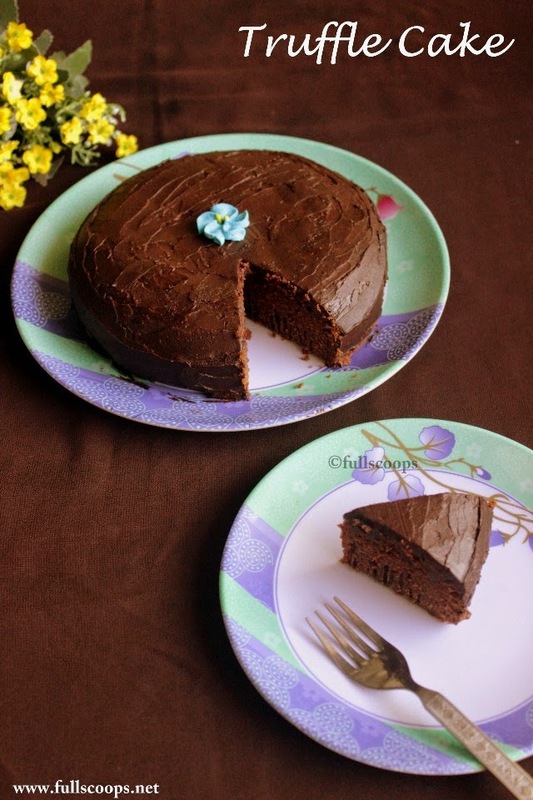 What makes blogging more interesting is the number of recipes and blogs that I come across everyday! 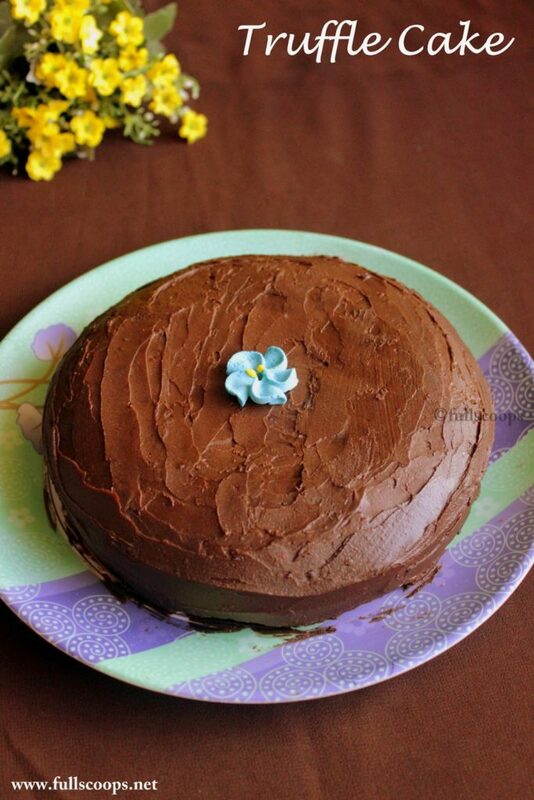 I chose to do this chocolate truffle cake for Sujitha, this recipe makes an awesome truffle cake. I halved the original cake to make a smaller cake. Hope you will love this cake. 1. In a large saucepan, cook the milk, butter and chocolate over low heat until melted. Remove from the heat, add the sugar and mix well until it dissolves. Let stand for 10 minutes until cool. 2. Preheat oven to 160° C. Grease and line a 8 inch pan. 3. Once the chocolate mixture is cooled, add the eggs and vanilla beat it in. 4. Sift in the flour, baking soda and salt and mix it all in. (batter will be thin). 3. Transfer to the prepared pan and bake for 25-30 minutes or until a skewer comes out clean. 4. Cool in the pan for 10 minutes and then remove and cool completely in the rack. 1. The original recipe calls for 3 eggs, since I halved the recipe I have used 2 small eggs. You can also measure and use 1.5 eggs. 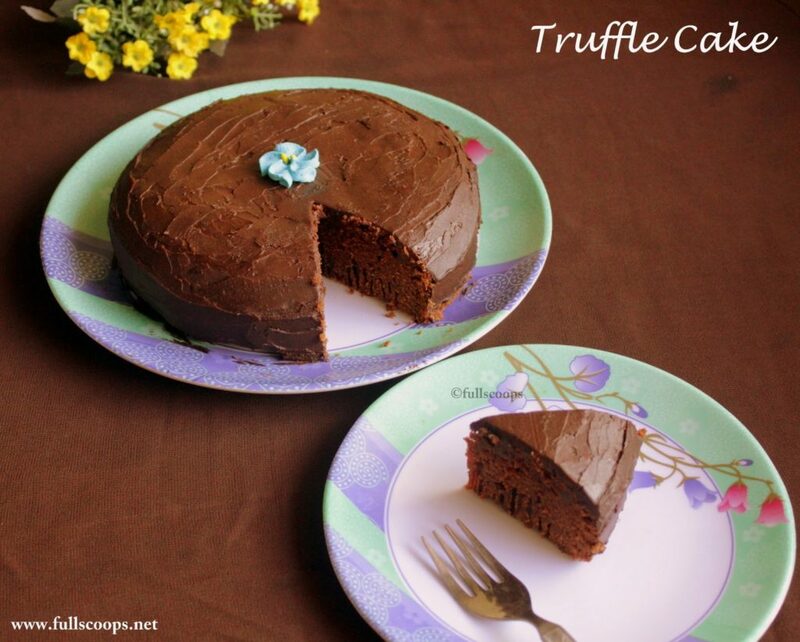 nice truffle cake Beulah. Looks so good. lovely guest post,Beulah and Suchi..yummy!